It would appear we called the “top” too soon, at least with respect to the number of homes listed for sale in the San Francisco. 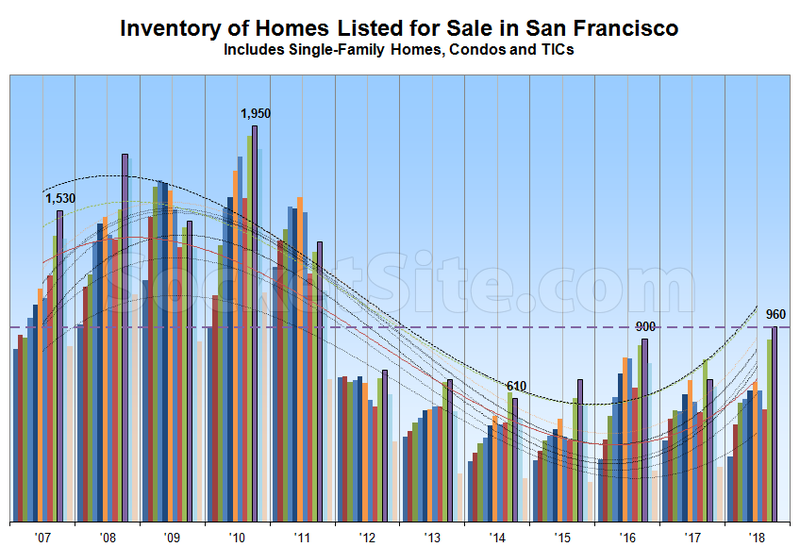 And having hit a 7-year high in September, the inventory of homes on the market in San Francisco has ticked up another 6.7 percent to 960 and total inventory is now running 31 percent higher on a year-over-year basis and 36 percent above its mark at the same time in 2015 (705), the year which remains an inflection point for the current cycle. 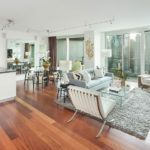 At a more granular level, the number of single-family homes currently listed for sale in the city (360) is now running 49 percent higher versus the same time last year while the number of listed condominiums (600) is up 22 percent, not including the vast majority of new construction condos for sale across the city. 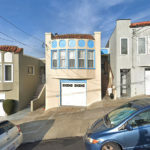 At the same time, 23 percent of the active listings in San Francisco have undergone at least one price reduction, which is roughly even with the same time last year, and the number of homes on the market listed for under a million dollars (330) is the most since 2016. As we wrote two weeks ago, inventory levels have likely peaked for the year and should start to decline though the end of December while the percentage of listings with a price cut, which ticked up another point over the past two weeks, should continue to increase. And once again, keep in mind that recorded home sales in San Francisco were 5.9 percent lower on a year-over-year basis in August having dropped to a seven-year seasonal low in July and pending sales remain down. Let me help you out a bit – as shown in the above data the “top” of unsold inventory on the market was in 2010 at roughly double the number of available homes compared to today’s market. So inventories are increasing but the sky isn’t falling. The key here is the trend. Inventory is rising while prices weaken and still sales dropped. This is a clear cyclical demand drop off. Also, in the past some ‘endless summer’ types claimed that even if demand slacked sellers would just hold off. Clearly this has not happened and as the crop of apples has shown sellers have even been willing to capitulate on price (much earlier in the cycle then even I would have expected). And it’s clear to see why sellers are eager to come to market. SF has had boom/bust cycles before and it will again, but these last two cycles have been extraordinarily large. The classic graph for a very long term view of national prices up to the last cycle is this one which should give you some perspective. We’ve had extraordinarily low interest rates, government support of the housing market, sky high tech valuations, people stretching to buy at very high price/income ratio and for a while SF was at a peak of national political influence with Nancy Pelosi being speaker of the house to a Democratic congress. Things were almost as good as they could get. So what are the chances that the next boom cycle will occur with so many favorable conditions and thus be equally large? And when will that boom cycle occur? If you get dealt a Queen high Straight Flush, in theory you could fold that hand and hope that on your next deal you’ll be dealt a Royal Flush. But probability tells you that you should probably go for the bird in the hand and not risk it all for the very slight chance of something better. Agree – the next boom cycle could be years away and it most likely will not be near as large as the previous one. That was a once in a lifetime alignment of factors. People seem willing to capitulate (to a degree) right now. Part of that may be a fair share of sellers are getting out of Dodge. If they can do it a near, but not at the top, they will go for it. There have been a number of recent sales near me where the sellers are leaving SF for jobs in other cities. That is a growing factor which is seen in the net domestic out-migration numbers for the Bay Area. The SFH market will hold up better than the condo market but the years of robust annual gains are over. I would be cautious when over-interpreting this chart. The lines are over-fitted and they create illusions of smooth up and down cycles. E.g. At the end of 2016, the inventory numbers shot up sharply. Looking at this graph, you would have called a fall in SF real estate market prices. Instead, prices have appreciated considerably over the past 2 years. You’re right, the “median sale price” has gone up! But that’s not the same thing as actual values. And a funny thing happens when you start looking at the actual apples-to-apples sales and activity. Regardless, if one thinks that price declines typically precede an increase in inventory levels, they simply don’t understand the fundamentals of the market. OMG, I actually found the exactly same article and comments from October 2016. Everyone saw the rising inventory numbers and knew that the market must be softening in 2017 & 2018. No doubt that increased inventories usually leads to softening in prices OR a softening in prices on actual sales leads to a buildup in inventories as sellers are holding out for yesterday’s market. Yes the median price has increased, which is the best indicator of what buyers will/can pay for a new home. With the increase in interest rates you should expect to see a decrease in median prices. Care to guess what happens to the median sale price when those buyers who are most sensitive to interest rate hikes (at the lower end of the market) exit the market, leading to lower sale volumes, while those who aren’t (at the upper end of the market) continue to buy? Nice hypothesis, and of course your proof is that prices continued to climb with the “glut” of inventory in 2016 – right? My guess (that you are asking for) is that sales will decrease in all categories, not just the bottom third. Perhaps you have a recent chart that actually depicts the absence of sales in the lower third? Well, as interest rates increased over the last 12 months, the Southern Neighborhoods (aka, lower cost tier of SF real estate market) appreciated faster than the remainder of the city. It is conceivable that higher interest rates shrink budgets and direct demand from higher priced neighborhoods (Potrero Hill, Bernal Heights) to lower priced neighborhoods (Portola, Excelsior). E.g. when a recession hits, demand at fast food restaurants doesn’t fall off a cliff. To the contrary, more people switch lunch at Olive Garden for lunch at McDonalds and the fast food industry can even see an increase in demand.